Opportunity rover: 14 years on Mars and counting! Fourteen years ago today, on January 25, 2004, three weeks after its twin named Spirit reached the Red planet, the Opportunity rover landed on Mars. It was expected to work on the planet for about 90 days, collecting information on Martial geology. By analyzing Martian rocks and soil, scientists were hoping to unravel the mystery of the planet’s past and, especially, water. There are many signs that Mars used to be a warmer wetter place with thicker atmosphere and, possibly, surface ocean of liquid water. What happened to the atmosphere? Could the conditions on the planet ever support alien life? (And, if so, where are the aliens?) These are the questions we were seeking the answers to. Also called Mars Exploration Rovers, Opportunity and Spirit, are 6 – wheel remote controlled solar powered robotic vehicles about the size of a golf car. They are equipped with a robotic arm, variety of tools (including sundial!) and a few cameras, for taking pictures and driving. Both were launched in January 2004, but sent to a different areas of Mars, that seemed to display (as seen from orbit) some signs of the past water presence. Their primary missions were planned to last for about 90 days, but after three months of hard work, the robotic explorers just kept going! Spirit worked for 6 years, before it got stuck in 2009. The ground support team tried really hard to recover the rover, but their efforts were unsuccessful. Spirit stopped calling home in 2010. 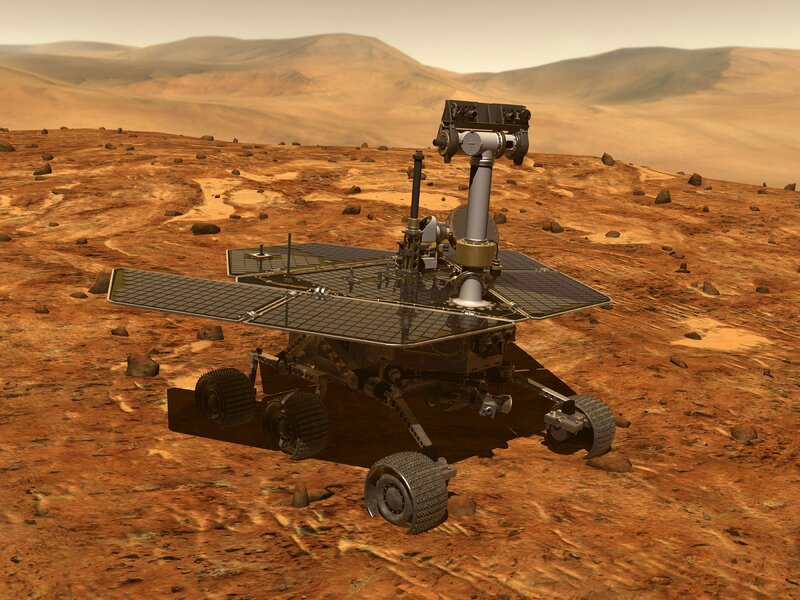 The second rover, Opportunity, is still fully operational today, fourteen years after landing on Mars, having spent more than fifty times its lifespan exploring the Red Planet. By now Opportunity has driven over 45 miles, sent hundreds of thousands of photographs and loads of data! It survived being stuck in the sand in 2005, a massive dust storm in 2007 (there might be another one later in 2018), as well as 7 winters on Mars (Remember, that one year on Mars lasts 687 Earth days, almost twice as long as the year on Earth! So seasons on Mars last longer. Winter, the shortest season, lasts for about 4 months). The rover even climbed the 32 degrees steep hill! (Not impressive, you think? Well, it was only built to climb slopes up to 15 degrees!) All of it without a single servicing or repair! Of course the rover shows signs of age. It experiences problems with the front wheel steering and with the flash memory. And the battery capacity is not what it used to be in its youth days! But scientists on Earth help their 6 wheeled colleague continue to work successfully despite all these problems! What are Opportunity’s most interesting findings so far? Meteorites from space on the martian surface! Still curious about the Opportunity rover? Read the original science papers. Here is the list! Meet some of the rover scientists and hear their fascinating stories. Find out what Opportunity is up to now and admire raw images taken by its cameras! Visit our mobile planetarium to learn more about Mars, Mars Rovers and search for water in the Solar System!